Source: Welcome to the new MicroStrategy community! , MicroStrategy Community, September 8, 2014, http://community.microstrategy.com/t5/Community-News/Welcome-to-the-new-MicroStrategy-community/bc-p/198140#M84. We’re very happy that you are here. We read and analyzed feedback from many events and surveys concerning our current Discussion Forums and Knowledge Base. 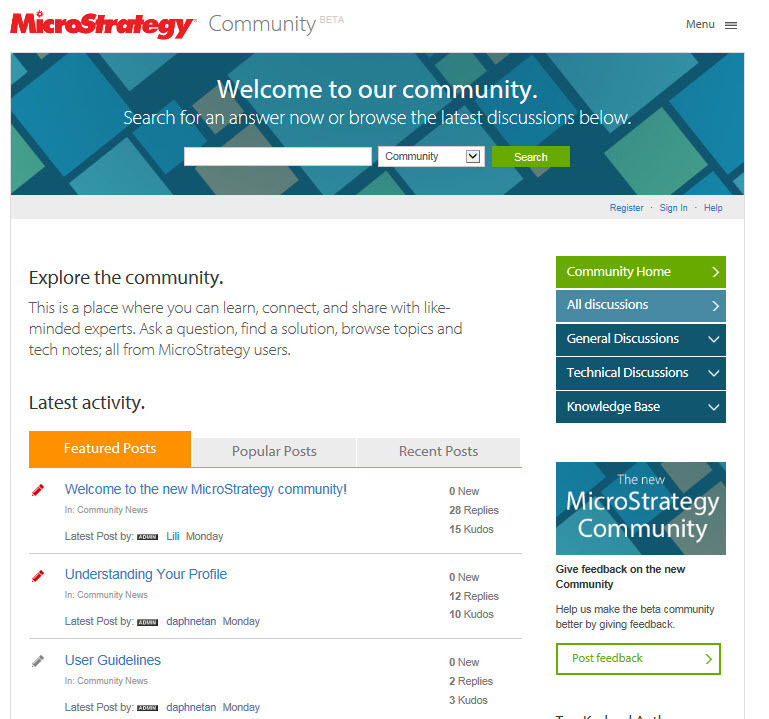 Today, we are proud to present to you the new MicroStrategy community. We’re very excited to have reached this milestone after a lot of hard work over the past six months. Our primary goal with our new community is to ensure the best possible experience for you when interacting with everything MicroStrategy. Not only have we enhanced the look and feel, but also merged the data of our Discussion Forums and our Knowledge Base into a single site. Our search capabilities have expanded to make our information easier to find and more accessible. Thanks for taking part in our beta launch. We hope it offers you a fresh perspective on what MicroStrategy can be as we focus on delivering a world-class customer experience that is simple, transparent, and empowering for everyone. MicroStrategy’s Community Team is always open to hearing from you. Post in the Community Feedback board to share your thoughts or message us to address your personal concerns. We are always looking for more ideas and suggestions because the more we share, the better we grow and design the community.